Hello Friends, Hope you are doing well and enjoying the hustle and bustle of the Holidays approaching! Toady’s card is for two challenges. First, my dear friend and Birthday Sister, as we lovingly refer to one another, is hosting this week over at Mod Squad and my card works in her challenge perfectly. Well, I always want to play along, but time is not always on our side, now is it? I used 5 of the 9 ingredient for my card! 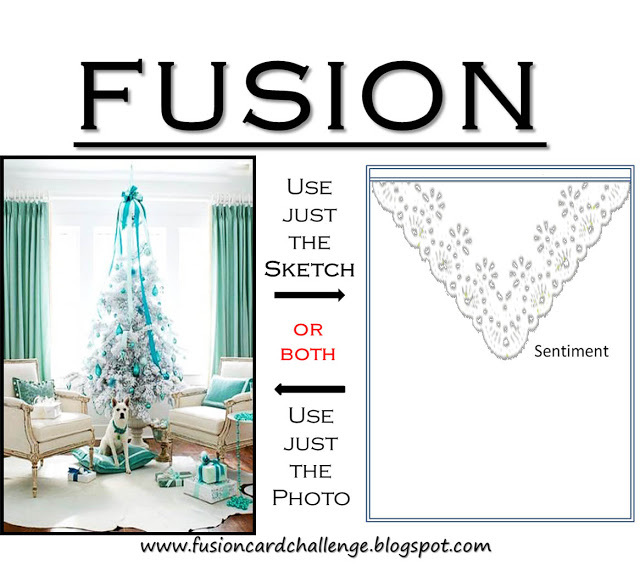 My card also is being linked up over at the Fusion Card Challenge where they have this beautiful blue Christmas tree for their photo inspiration. I am using the photo not the sketch. As promised, when I showed you my green speckled Christmas card a few weeks ago, I mentioned I would be posting the blue one at a later date. I really love this one the most! Even the photo doesn’t quite do this card justice, it’s really sparkly and pretty in real life. Categories: Cards | Tags: Card making, Cards, Christmas, rubber stamps, stamping, Stamping Up, Verve Dies | Permalink. This is so pretty. I love the blue and the sparkly. I do the inside of my cards when I get ready to send them out. Beautiful Christmas card design. Love it in the blue! I love the colors on this one…such a nice change from red and green. That tree is so pretty and I love the striped paper! Well done! Your splat tree is fantastic … so very glad you joined us at Fusion Card Challenge. Beautiful card! Love the different shades of blue and how you created your tree! Brilliant! Love this card Nancy especially since I have a version of this beauty! Somehow I missed the first post on this great way of creating a tree, Nancy. I do get behind in commenting sometimes. I love the background paper you chose and all the silver glitter.